The room didn't have a fridge or jug. After flying almost 15 hours I would have liked to enjoy a nice cuppa in the room. The room was very nice but overall it could have been better get a fridge and a jug for the room. 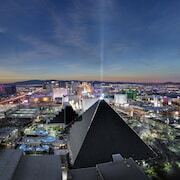 Close to the strip Within walking distance of all the casinos. Hotel staff are lovely. Free parking. Safe in room. Views are beautiful. Clean. Wifi available, fast. Great stay! A bit out of the way from were all the action was. Very long queues to check in. It was too hot to walk streets during the day but to catch any metro was nearly impossible as it was further away then the Moon. Not user friendly at all. Dont bother Old and run down, no atmosphere, disgusting buffet, poor drink service. Rooms are smoke filled eithout venting and paper thin walls soo far away from the strip. The veiw from the top is nice at night but visit it on your way to old vegas do not stay! Go ahead and say 'Bye, Felicia' to ordinary life and hello to Las Vegas. If you're busting to get away, lastminute.com.au can help you lock in an absurdly good-looking rate on a hotel room (Felicias not included). Want to stay in the middle of the action? No dramas. You can choose from an impressive 79 hotels within 2 kilometres of the city centre. 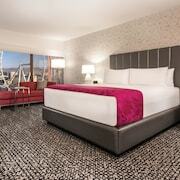 The SKYLOFTS at MGM Grand and the Mandarin Oriental, Las Vegas are a couple of the most central digs in Las Vegas. The Nobu Hotel and The Cosmopolitan Of Las Vegas are also worth considering. 5 kilometres from the middle of town is Paradise, which contains 99 hotel options. 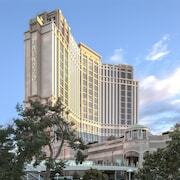 Consider organising a room at the Four Seasons Hotel Las Vegas and Encore at Wynn Las Vegas. Another favoured neighbourhood is Las Vegas Strip, just 0.6 kilometres from the city centre. 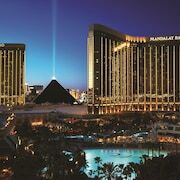 A few of the 38 hotels available here include the Wynn Las Vegas and Bellagio. Heading to the Las Vegas Convention Center is an absolute must! Can you claim you've been to Las Vegas if you don't see it? Like to stay within ambling distance? The Marriott's Grand Chateau and The Palazzo Las Vegas are your top options. At lastminute.com.au, we're all about unforgettable experiences. So, believe us when we say Las Vegas Premium Outlets is certainly worth checking out. To stay nearby, try the Hilton Grand Vacations on the Las Vegas Strip or the Hilton Grand Vacations on Paradise (Convention Center). One more top attraction, Fashion Show Mall also ought to be locked in to your travel plan. 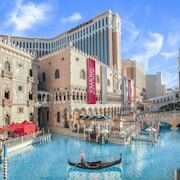 The Venetian Las Vegas and the Luxury Suites International At The Signature are both only a stone's throw away. Enjoy the quiet surroundings as you browse the artworks on show at Marjorie Barrick Museum. Platinum Hotel and Las Vegas Marriott are a couple of legit options if you and the squad are eager to stay in the vicinity. If you're fascinated by science, a tour of Desert Research Institute will be time well spent. As luck would have it, Caesars Palace - Resort & Casino and Hilton Grand Vacations at The Flamingo are nearby, so you can swing by and see it whenever you fancy it! Ever had to spend a night on the airport floor cos you got too excited and forgot to make a hotel booking? Save yourself the backache and snap up a room at the Bluegreen Vacations Club 36, Ascend Resort Collection or the Desert Rose Resort. Both aren't far from McCarran International Airport, which is only 4 kilometres from the centre of town.